The following discussion of FDR’s 100 Days was written in May of 2013, and has been slightly edited for republication. FDR’s New Deal moved to reverse more than 30 years of subversion of the American System of economics, and restore the principles enshrined in the Preamble of the U.S. Constitution. That process began during his first 100 days in office, one of the most rapid-fire periods of economic legislation in our nation’s history. FDR visits with farmers in North Dakota in the 1936 campaign. The word “Deal” implies that the Government itself was going to use affirmative action to bring about its avowed objectives rather than stand by and hope that general economic laws alone would attain them. The word “New” implied that a new order of things designed to benefit the great mass of our farmers, workers and business men would replace the old order of special privilege in a Nation which was completely and thoroughly disgusted with the existing dispensation. But we were not to be content with merely hoping for these ideals. We were to use the instrumentalities and powers of Government actively to fight for them. And fight he did—against the powerful financial interests, in London and Wall Street, who had brought the nation and the world to their knees, and sought to impose a global fascism to maintain their power. They did not succeed, because FDR, aware of the American System tradition that went back to his ancestor Isaac Roosevelt, a collaborator of Alexander Hamilton, was determined to reassert that system, for the benefit of the nation and the world. 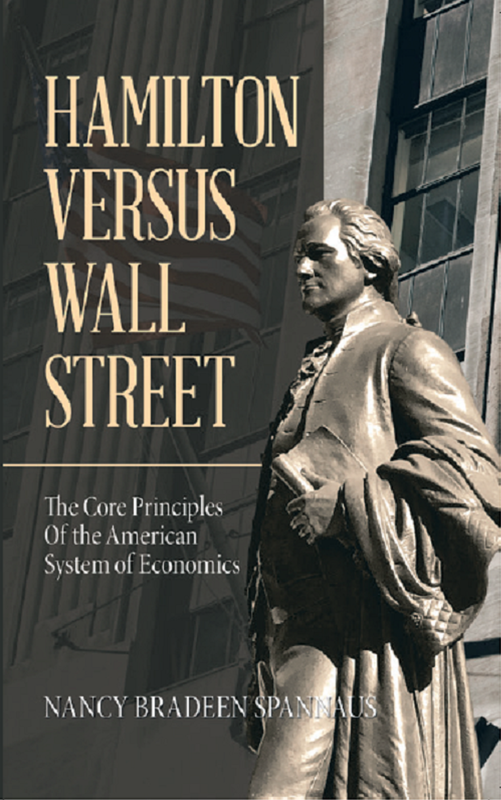 Understanding the principles he used in his fight is crucial to restoring the American economic system, beginning with Glass-Steagall, in the crisis period ahead. When FDR took office in March 1933, he inherited a financial and political system which had been dominated, since the time of his (distant) cousin President Theodore Roosevelt (1901-08), by British economics. The axioms were those of British free enterprise, and the enforcer of the free market system, which had sacrificed the lives of millions of Americans by putting banking interests first, was the banking system, dominated by the Morgan-Mellon-du Pont interests. The primus inter pares among the bankers was J.P. Morgan, a leading financial ally of the British banking system. The Morgan interests’ control of credit gave them life-or-death control over the physical economy, and they were determined to use it to prevent implementation of policies they didn’t like, and to otherwise loot the economy and the population. Farms had been shut down en masse, while speculative schemes had flourished. Political favorites had gotten credit, whereas many productive enterprises received none. More importantly, these banking consortia worked in such a way as to deprive the United States of its sovereignty, through the enforcement of the British gold system. The creation of credit was limited by the amount of gold held by the banks. Therefore, if the major banking interests decided to sell off their gold to buyers overseas, this resulted in a contraction of credit in the U.S. If the gold supply were controlled from overseas, as it effectively was, through the close-knit British-American banking establishment, then, the U.S. actually lacked sovereign control over its own currency and credit. President Roosevelt moved immediately to remedy this situation when he took office in 1933. At the same time that he declared the famous Bank Holiday, he suspended all transactions in gold, and gave authority over any such matters to the Secretary of the Treasury. This is the basis on which the Federal government got the authority to regulate the price of gold, rather than let that money-linked commodity be controlled by private interests. It meant that American monetary policy was no longer to be the quasi-automatic function of an international gold standard; that it was to become instead the instrument of conscious national purpose. After removing gold as a weapon that could be used by institutions hostile to the purposes of the Federal government, either foreign or domestic, FDR still had to create the basis for a national credit system that would serve the interests of the nation. This was accomplished through his various pieces of banking legislation, and the banking regulation measures which aimed at preventing the banks from being used to loot the population and productive enterprises. The first point that had to be recognized was clear: the banking system was bankrupt. By calling the Bank Holiday on March 5, Roosevelt dramatized this reality by ordering them all to be closed. But then, he had to put the system back together again, which he did through the Emergency Banking Act. This Act, which was rushed through Congress in time to reopen the banks (or, most of them) on March 13, had various provisions for sorting the banks into three classifications: those that were sound; those that needed a capital infusion; and those which a conservator would liquidate. It also permitted utilizing Federal government instruments, like the Reconstruction Finance Corporation and the Federal Reserve System, to ensure that liquidity would be provided for those banks that were basically sound, but needed it. Upon passage of the Emergency Banking Act, auditors from the Federal government were sent out around the country to examine the banks’ books. When March 13 arrived, the day after an estimated 60 million Americans had heard President Roosevelt address them on how they had “nothing to fear but fear itself,” a large majority of the nearly 19,000 nationally chartered banks opened their doors, providing the basis for issuing payrolls, and maintaining government and other necessary social functions. Sufficient confidence had been restored, that the same citizens who had been carrying out runs on the banks, now put more money into the banking system in this period, than they took out. A number of necessary complements to the audit came later in the 100 Days, including, most importantly, the Glass-Steagall Banking Act which separated commercial and investment banking, and established the Federal Deposit Insurance Corporation. There were, of course, vociferous objections to FDR’s banking measures in this period, by those arguing that there was a “principle” that “private enterprise”—not government—should run the economy. Just as today, these critics were merely spokesmen for the predator banks, and against the Constitution. There is no question that the U.S. Constitution gives control over the currency of the United States to the Federal government, specifically Congress. Article I, Section 8 makes that clear. And when this principle was challenged in the early days of the Republic, the founding genius of the American System of economics, Alexander Hamilton, came forward to argue the case explicitly. FDR had not only studied Hamilton, but located his own identity in the tradition which began with his great, great grandfather Isaac Roosevelt, who had fought alongside Hamilton to get the U.S. Constitution ratified in New York, and later collaborated with Hamilton in forming the Bank of New York. Although FDR’s banking measures never went so far as to restore the National Bank, the President found a way to exercise this sovereign power by other means. He blasted his opponents as “economic royalists,” who claimed to believe in political freedom, but “have maintained that economic slavery was nobody’s business.” “What they really complain of is that we seek to take away their power,” he said. National sovereignty, however, as FDR understood, is not just a question of power, but the use of that power for the common good—what the Preamble to the Constitution calls the “general welfare.” It was on this basis, that the President justified his far-flung initiatives for creating jobs, saving the farm sector, and establishing a safety net for those who had suffered from the “dog-eat-dog” economy which had predominated under the Tory ideas of Andrew Mellon, Calvin Coolidge, J.P. Morgan, and the like. The most famous of FDR’s measures for relieving the suffering of the poor came in what is called the second phase of the New Deal, in 1935, when he moved with Democratic supporters in Congress to push through both the Social Security Act and unemployment insurance. These measures, which immediately came under attack by the Morgan-led banking interests, eventually survived a challenge that reached the level of the Supreme Court, which ruled that they were consistent with the general welfare clause of the U.S. Constitution. While many Americans don’t realize it today, the measures which FDR took in these first hundred days and later, were literally matters of saving lives. Starvation faced millions of Americans who had been thrown off their land, out of their homes, or out of their jobs. People could not afford doctors, or food, or, in many cases, roofs over their heads. The private sector, and bankrupt local governments, were either throwing up their hands, or turning their backs. It was left to the Federal government to come to the rescue. A destiitute family in Alabama during the Depression. FDR’s Administration did not wait long in implementing this philosophy. The first measure he took was the creation of the Civilian Conservation Corps, a government-administered program to create jobs, especially for unemployed youth. Over the course of its history, the CCC created millions of jobs, which permitted young men to support their families, and regain their health and morale, while doing something useful for the natural resources of the country. This jobs program was followed later with the creation of public-works programs, which provided millions more with useful work, particularly in the repair and construction of infrastructure, such as waterworks, roads, and schools. Roosevelt’s appointee Harry Hopkins personally embodied the spirit of these jobs programs, as non-bureaucratic responses to the need for public improvements, as well as incomes. Other immediate measures for saving lives involved ending evictions from homes and farms. Millions found themselves without the ability to pay their mortgages, or to get credit to refinance. FDR recognized this as a national emergency, and intervened to provide the means for refinancing for those who were in desperate need. While his opponents screamed about “socialism,” FDR could confidently scoff at them. He knew that his programs were providing the basis for putting the nation back to work, and restoring the tax base. Every Federal works program created many corresponding jobs in the private sector which had to provide the materials. Every infrastructure improvement increased the potential for a productive, skilled workforce. While helping the poor, these programs demonstrably lifted the conditions of life for the entire nation—i.e., served the general welfare. The third major principle of our Constitutional commitment is the requirement that our governance provide for the welfare of future generations. FDR immediately began to put our government behind this principle, by launching major infrastructure projects in water management, power generation and production, and transportation, all of which would improve the conditions of life for decades to come. The epitome of this aspect of his program was the Tennessee Valley Authority, a project long on the drawing boards, which FDR pushed through in May of 1933. Bonneville Dam under construction in 1936. Major infrastructure projects, such as the Bonneville hydroelectric dam and the TVA, were conceived by Roosevelt not just as jobs programs, but as means of permanently upgrading the productivity of the economy and the productive powers of labor. Such projects introduced the era of cheap electricity, and in many cases, provided the basis for conquering disease and the devastation of periodic floods. FDR knew that they would not pay for themselves in the short term, but only over the long-term, and not just in terms of dollars and cents, but, most importantly, in terms of the standard of living of the entire nation. Over the course of his 12 years in office, FDR launched more than 45,000 projects in the five basic categories of infrastructure: water, power, transportation, health, and education. Many of the structures his programs built—from parks, to sewage systems, to dams and hospitals—are still being used throughout the nation, some 80 years later. In this era, there is perhaps no more crucial lesson for our citizens to learn than this principle of our Constitution, as laid out in the Preamble: of providing for our posterity. The commitment to improve nature and society, for the benefit of future generations, has become increasingly foreign to our national philosophy, since the 1960s counterculture and the “me” generation. There used to be a joke in the 1970s, that whereas the Japanese businessman planned for six years ahead, the U.S. businessman planned for six minutes, this being the amount of time that it could take for stocks to be traded on the relevant gambling exchanges. In today’s computer age, the attention span has contracted further, to perhaps six seconds. There are many who would say that we can’t return to FDR’s way, and who are even committed to ripping up the physical improvements built under his Presidency. They are wrong in principle, as well as in practice. They should study the history of how FDR brought us out of the Great Depression, before our sinking into a worse one (which has already begun) becomes irreversible. In the crisis of 1929-33 Americans had a leader, Franklin Roosevelt, who reasserted the principles of the U.S. Constitution over the economic predators who had brought the nation to its knees. Today, American citizens must turn to those same principles again, if we are to survive.